Nice, warm, and fit great! I just got these knee warmers, and they not only feel nice and have great reflectivity, but they're all so nice and warm. They also fit me really good, and these will be my go-to leg warmers in the cold. I'm a very short person, and I find the leg warmers are too long for me and hard for me to use. But these knee warmers do the trick. I bought these knowing that I have larger than average legs and whilst the XL is snug it's non constrictive. They are longer than other knee warmers I've had too so actually cover my calf. Only downside is a bit of bunching behind the knee. These are really nice knee warmers. They are slightly thicker and warmer than the Castelli Nanoflex equivalents. Personally, I would recommend these for cold days around 9-14 degrees. I am around 175cm tall and 72kg with , and I bought the large size, which I'm very happy with. I haven't really tested them in the rain yet to verify how water repellent they are. I bought these in size large (I am 182cm and 74kg) and they are a great fit. They are slightly longer than other kneewarmers I have had, so they cover down to about mid-calf. The material is nice and stretchy and they don't restrict movement at all. They are fairly warm and the No Rain surface does a good job of keeping most of the water out. I do like these knee warmers. I haven't worn them in a down poor so give a full verdict on their waterproofness yet, however, they work great at repelling road splash water and keep my knees warm. If the rest of the no-rain range is to go by, I won't be disappointed in the rain. A must buy!! I wore my Castelli Nanoflex Knee Warmers for the first time on a cold & windy Sunday morning and the Result was a very warm & dry ride. They really do block out the chill and the small amount of rain we had simply ran off the Nanoflex material. 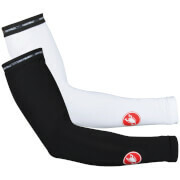 The grippers ensure the knee warmers stay pulled up especially when used with the Castelli Nanoflex Bibshorts. Excellent ! I wore my Castelli Nanoflex Knee Warmers for the first time on a cold and windy Sunday morning and the Result was a very warm and dry ride. They really do block out the chill and the small amount of rain we had simply ran off the Nanoflex material. 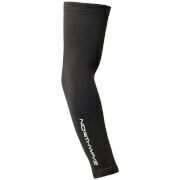 The grippers ensure the knee warmers stay pulled up especially when used with the Castelli Nanoflex Bibshorts. Excellent! These are well made, lightweight, stretchy and warm, and they do a good job of keeping the worst of the cold and wet weather off your knees. 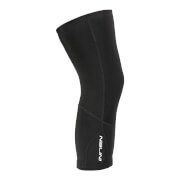 The fit is spot-on, so there's no wrinkling of the fabric or chafing behind the knee like I've had with other knee warmers. I'd be happy to recommend these.